(NaturalHealth365) While the planet’s surface is over 70 percent water, only 2.5 percent of that water is considered ‘fresh”, making potable H2O one of the most prized resources on earth. However, according to recent studies concerning the quality of the nation’s tap water, Americans have good reason to be alarmed each time they consume non-purified water. The EWG’s Tap Water Database analyzed data and samples from nearly 50,000 public water utilities across the nation looking for 500 various industrial and agricultural contaminants. The shocking results exhibited toxic drinking water in all 50 states, with more than 267 known carcinogens and contaminants present that are KNOWN to cause cancer, nervous system damage, fertility problems and to be especially harmful to children. Why are the dangers of toxic drinking water being ignored by U.S. industry regulations? Faucets shooting flames of fire … nasty nitrates, the Flint, Michigan water scandal … chromium-6, which was brought to mainstream attention in the movie “Erin Brockovich” … millions of Americans are suffering from various conditions at historic levels. So, why is nothing being done on the governmental level to end water pollution? It’s not that the government doesn’t know the vast dangers of water contamination, but the reality is that most of the drinking water suppliers in the U.S. receive ‘passing grades’ from state and federal regulation agencies. This is because these levels of water pollution are considered legal under the standards of the Safe Drinking Water Act and other state regulations. The problem is that modern science has proven that these levels pose countless health risks. Sadly, more than 160 known contaminants are unregulated, meaning they have no legal limits whatsoever. Frighteningly, the U.S. Environmental Protection Agency (EPA) has refused to add any new contaminants to their listing of regulated tap water pollutants in over two decades. This puts every consumer at risk who doesn’t take immediate action concerning the state of their drinking water, and it’s actually much easier than you might think. First, we recommend entering your zip code into the EWG Tap Water Database today to see the current state of your water locally. This is a free service to use, and within a few clicks, you can read exactly which contaminants were found within that zip code during the last samplings by the EWG. Armed with this valuable information, you’ll know which contaminants need eradicating. The absolute best way to protect yourself and your family from the vast dangers of water contamination is to use a high quality water purification system. Experts recommend choosing a system that holds ionic minerals while removing the majority of contaminants such as lead, nitrates, aluminum, organic compounds, arsenic, viruses, mercury and fluoride. To learn more about the U.S. water crisis and about the incredible effectiveness of Berkey Water Purification Systems by listening to this NaturalHealth365 Podcast with Jonathan Landsman discussing this critical topic. 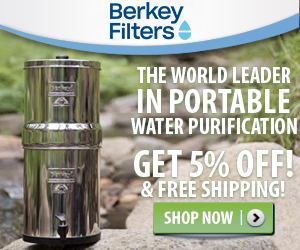 Editor’s note: If you’re interested in a high-quality, water purification system, I highly recommend Berkey Water. Click here to learn more.